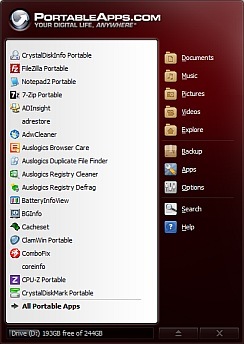 Portable applications are programs you can run on your computer without installation. They are especially useful if you want to use a special program for a short time, such as a tool for removing a particular virus. Files in the user's profile folder. File associations - so it becomes a default for opening that file type. DLL's, hardware drivers , etc. etc. No need to uninstall when you no longer need them. Portable Apps is a repository of portable applications, and also provides a platform for collecting and launching your portable applications. And of course it too is portable. Choose and get them from the Portable Apps repository, because they are all checked for malware. The portable apps platform also provides an easy way to keep the apps updated. Images: Fotografix image editor, GreenShot, IrfanView image viewer. Maintenance: Back4Sure, CCleaner, Revo uninstaller, TreeSize free, BatteryInfoView. 32 or 64 bit? Many applications now available come in 32-bit and 64-bit builds. A 64 bit version will not run on a 32 bit OS; In general there is little benefit in running the 64 bit version so for compatibility I only use 32 bit versions. If you really need a 64 bit app consider an installable version.